Egypt’s military spokesperson denies report that Israel has been attacking ISIS targets in Sinai with Egyptian approval. Egypt’s military spokesperson Tamer El-Refaai on Sunday vehemently denied a report by The New York Times which claimed that Israel has launched air strikes against Islamic State (ISIS) targets in northern Sinai with Egyptian approval. Speaking with The Egyptian Independent news website, Refaai insisted the report is not “credible”. The attacks were carried out at the request of Egyptian President Abdel Fattah Al-Sisi, in order to aid Egypt in fighting against ISIS terrorists in northern Sinai, the sources told The New York Times. 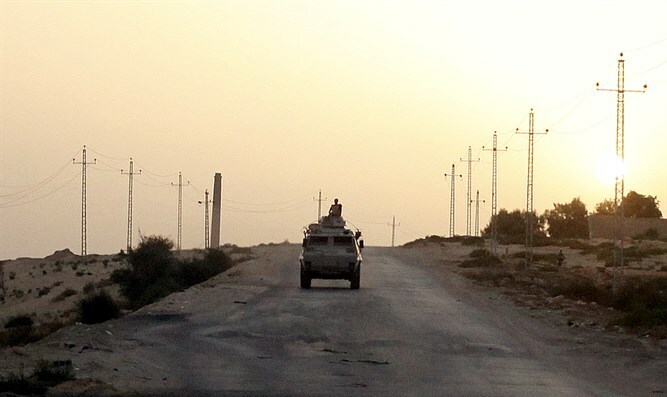 Refaai denied the authenticity of the report, saying that the Egyptian army is the sole entity that is conducting military operations in co-operation with local police forces in certain areas in North Sinai. He stressed that the report is inaccurate and not credible, calling on media outlets to first investigate the accuracy of what is being published. Earlier on Sunday, Prime Minister Binyamin Netanyahu said Israel would "do whatever is necessary to defend ourselves", though he did not specifically comment on The New York Times report. Speaking at the start of the weekly cabinet meeting, Netanyahu referred to recent meetings with President Donald Trump, European leaders and Russian President Vladimir Putin. "As I also made it clear to President Trump and afterwards to European leaders and President Putin, our presence here is the main element in the Middle East blocking the spread of radical Islam, led by Iran and Islamic State, which also threaten all other elements in the world," he said, according to AFP. "We are not bent on war, but we will do whatever is necessary to defend ourselves," the prime minister stressed. Most of the attacks in the Sinai Peninsula in recent years have been claimed by the Sinai Province, the Egyptian affiliate of ISIS which pledged allegiance to the jihadists in 2014. The peace treaty signed between Egypt and Israel in 1979 imposed strict limitations on Egyptian deployment in the Sinai, and any Egyptian incursion in the Sinai requires coordination with Israel. In recent years Israel has notably permitted the Egyptian military to boost its presence in the peninsula several times.